Lines can be terrible, they can signal a miserable hour at a government department staring intently at the person in front of you. In the case of food venues though, lines are a blessing. Lines are orderly, conversation starting, excitement generating means of finding the very best places to eat in a new city and this was one of the ways we found DOC Gastronomy. Close to our accommodation in Carlton, we’d walked past on previous nights and couldn’t help but notice the number of people waiting. DOC refers to a number of venues that serve up delicious modern Italian eats and on a whim we decided to give them a try. Needless to say we were so glad we did. We were lucky there was only two of us and were able to squeeze inside without a wait when we ventured back for dinner. The restaurant was almost elbow to elbow with diners and the wait staff maneuvered with absolute precision between the tables. The service was friendly and prompt and we were pleased to find ourselves seated opposite their impressive collection of awards. 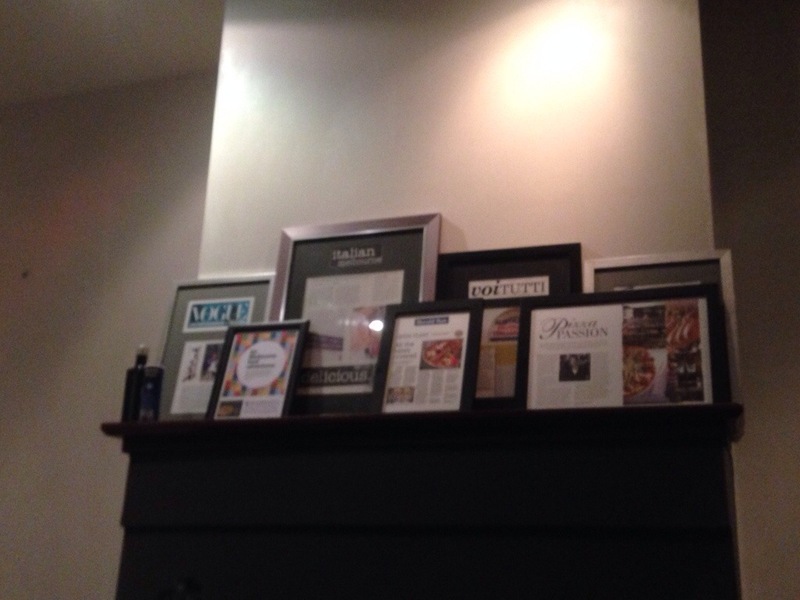 The menu made us happy, such passion for food is exactly what we look for when we eat out. We decided to order smart and went for a pizza and salad to share between two, a strategic move to allow us room for a delicious looking dessert pizza. 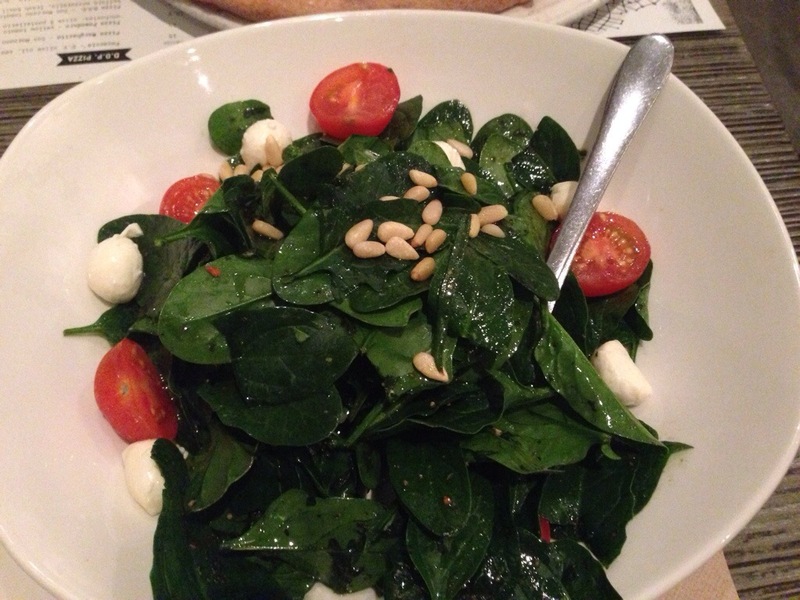 Our salad was baby spinach with pesto, pine nut, Cherry tomato and bocconcini. Whoever started the movement that relegated spinach purely to the realm of smoothies had something to answer for. The pesto and nuts had a great meatiness, and we loved the bocconcini and Cherry tomato. We could have done with more of the accompaniments, but to be fair this was supposed to be a spinach salad. We also tried a pizza, the San Danielle. 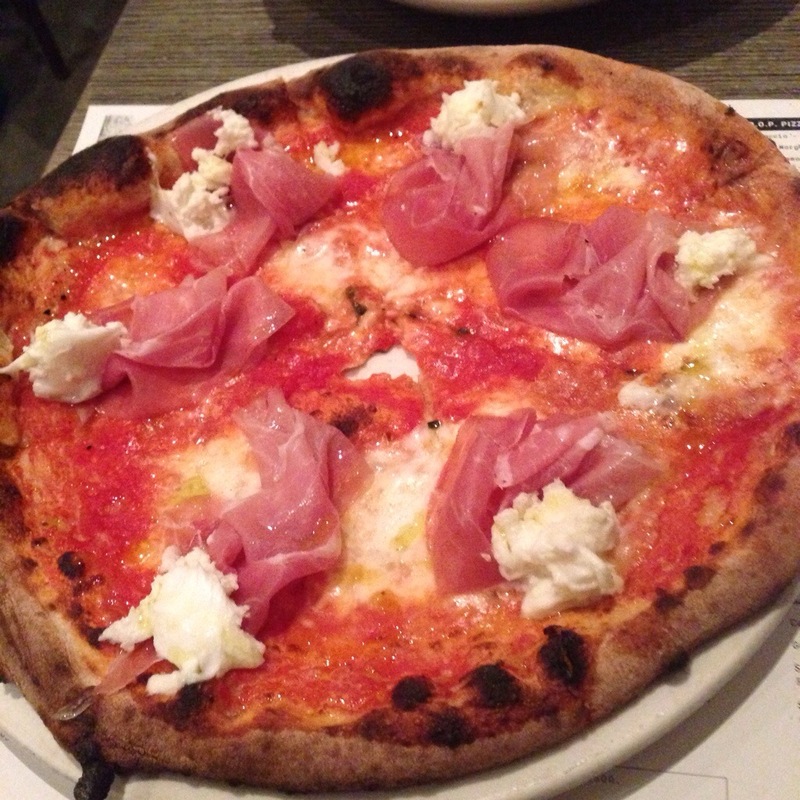 It came with prosciutto, buffalo mozzarella and tomato. The cheese on this pizza is something else. DOC Gastronomy use only the highest standard, authentic cheeses and we have to say their buffalo mozzarella was particularly delicious. The pizza had fabulous ingredients with a crisp base and just the right amount of toppings to get a bit of everything and still appreciate the base. Fortunately for us, the menu doubles as a placemat, and we were quickly able to hail a waiter and order a Sicillian Dessert Pizza. 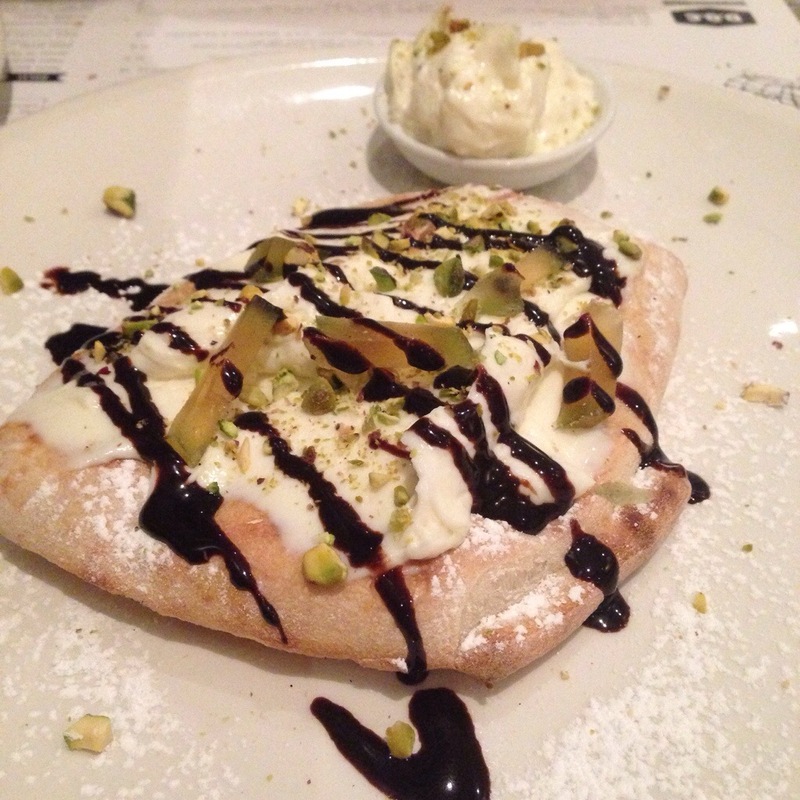 The pizza looked an absolute treat, with buffalo ricotta, candy citron, toasted pistachio with a chocolate vinacotto. The flavours were really lovely, and there was a great contrast between the creaminess of the ricotta and the sharpness of the vinacotto. There was a similarly great crisp base, and the crunch of the toasted pistachio and hit of lemon jelly lolly helped make this pizza brilliant. D.O.C. Gastronomy serve up delicious, authentic and nuanced Italian with that little bit of love. It’s obvious the staff love what they do, and we couldn’t fault the service we received. 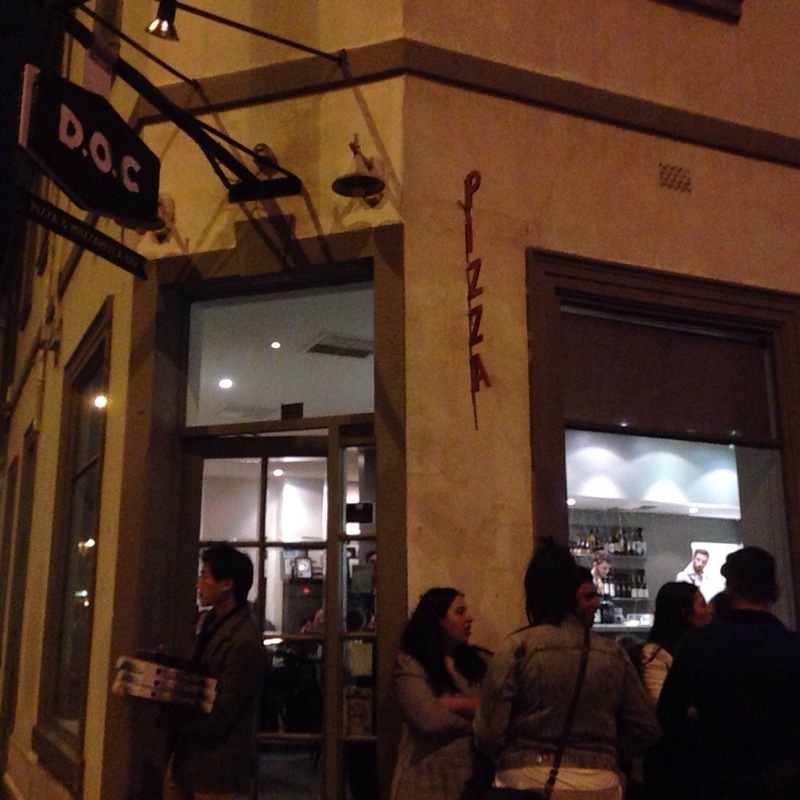 If you’rr looking for a great pizza, D.O.C. in Carlton will have you covered!